20 FLEX007 MAGAZINE I JULY 2018 tant, up to a point. There is a minimum optimal bend radius which is largely a function of the properties of the copper foil. The less ductile the copper, the larger the bend radius should be. However, there are some long established rules to keep in mind: • For a single metal layer, the minimum bend radius should be on the order of 3–6 times the thickness of the circuit. • For two metal layers, the minimum should be 7–10 times the thickness of the circuit. • For multilayer flex, the minimum bend radius should be 15–20 times the thickness or more. 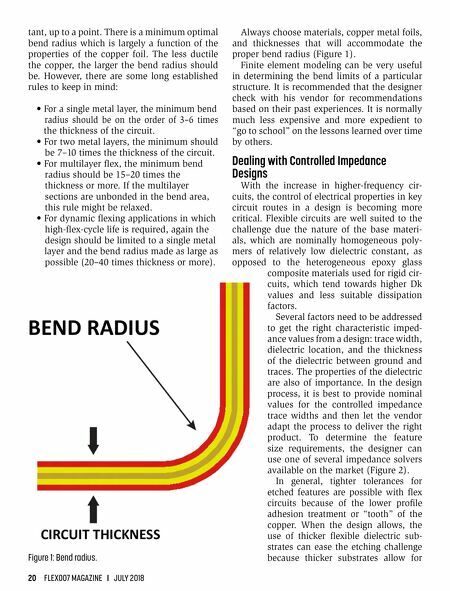 If the multilayer sections are unbonded in the bend area, this rule might be relaxed. • For dynamic flexing applications in which high-flex-cycle life is required, again the design should be limited to a single metal layer and the bend radius made as large as possible (20–40 times thickness or more). Always choose materials, copper metal foils, and thicknesses that will accommodate the proper bend radius (Figure 1). Finite element modeling can be very useful in determining the bend limits of a particular structure. It is recommended that the designer check with his vendor for recommendations based on their past experiences. It is normally much less expensive and more expedient to "go to school" on the lessons learned over time by others. 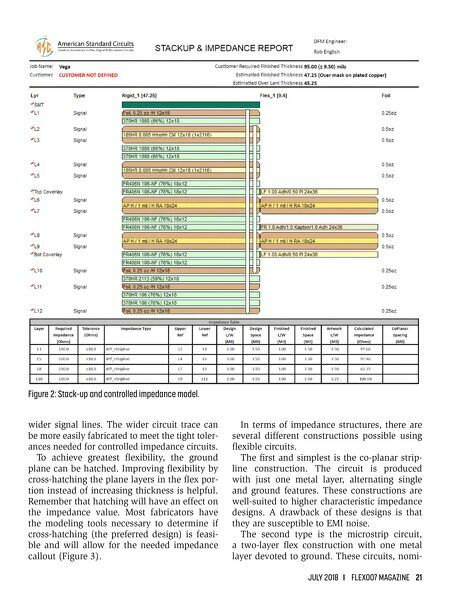 Dealing with Controlled Impedance Designs With the increase in higher-frequency cir- cuits, the control of electrical properties in key circuit routes in a design is becoming more critical. Flexible circuits are well suited to the challenge due the nature of the base materi- als, which are nominally homogeneous poly- mers of relatively low dielectric constant, as opposed to the heterogeneous epoxy glass composite materials used for rigid cir- cuits, which tend towards higher Dk values and less suitable dissipation factors. Several factors need to be addressed to get the right characteristic imped- ance values from a design: trace width, dielectric location, and the thickness of the dielectric between ground and traces. The properties of the dielectric are also of importance. In the design process, it is best to provide nominal values for the controlled impedance trace widths and then let the vendor adapt the process to deliver the right product. To determine the feature size requirements, the designer can use one of several impedance solvers available on the market (Figure 2). In general, tighter tolerances for etched features are possible with flex circuits because of the lower profile adhesion treatment or "tooth" of the copper. When the design allows, the use of thicker flexible dielectric sub - strates can ease the etching challenge because thicker substrates allow for Figure 1: Bend radius.